Prior to becoming a Chiropractor, Dr. Auth was a professional high diver and entertainer. He also competed in mogul skiing and mountain bike races. As happens to many athletes, his high-impact lifestyle eventually took a physical toll on his health. Dr. Auth was diagnosed with degenerative disc disease, three herniated discs, and suffered from severe sciatica. He became unable to do everyday activities such as walk his dog, shop for groceries or even complete simple household tasks. It was recommended he undergo a complex spinal surgery that would fuse multiple levels of his spine and permanently limit motion in his lower three vertebrae. 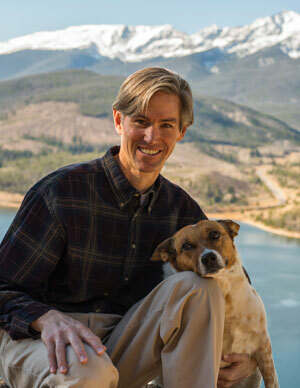 Having witnessed the chronic pain suffered by his many of his patients who had undergone spinal fusion procedures, Dr. Auth began searching for a way to heal himself naturally and avoid surgery. His goal was to treat the cause of his symptoms and restore his health. He was determined to continue with his active lifestyle, enjoying the outdoors. Dr. Auth completed his Chiropractic studies alongside Dr. Richard Busch at Parker College of Chiropractic. Dr. Busch later created the DRS Protocol,™ which he found, in many cases, to be a successful alternative to spinal surgery. His protocol was designed for the Intervertebral Differential Dynamics (IDD) machine, the same one we use in our office to perform DRS Protocol™ treatments. Extensive research convinced Dr. Auth the DRS Protocol ™ could be the solution he was searching for, and he brought the Intervertebral Differential Dynamics (IDD) machine to his office in Summit County, Colorado. He and his staff flew to Indiana to train directly with the inventor, and Dr. Auth became his own first DRS Protocol™ patient. After six weeks, Dr. Auth experienced significant relief. After completing the full course of treatment, he was not only able to walk without pain and hike with his dog again—he was able to return to his active lifestyle of skiing and mountain biking. I once again feel completely free to do all the activities I’ve come to love in Colorado. Dr. Auth wants people to understand how incredible his own results have been, especially considering the severity and complexity of his case. Having personally experienced the debilitating limitations of chronic pain, Dr. Auth takes great pride in seeing his patients return to their active lifestyles, free of pain, happy and hopeful about their health and their future. He is on a mission to help others live full lives and do everything they want and need to do—without compromise. Unable to watch the video for any reason? Prefer to read? Click here to view a transcript of Dr. Auth’s video. Do you want to heal yourself without surgery, like Dr. Auth did? Discover how the DRS Protocol™ can help you. There’s no obligation, and you can expect a thoughtful, caring consultation. Call us at 970-368-7287 or complete the form below and together we will explore your options for living pain-free and getting back to doing what you love. The Accu-SPINA™ system used to deliver the DRS Protocol™ is a class II medical device with a 510(k) FDA clearing. The system is designed to induce decompression, reduction and stabilization of vertebral structures.